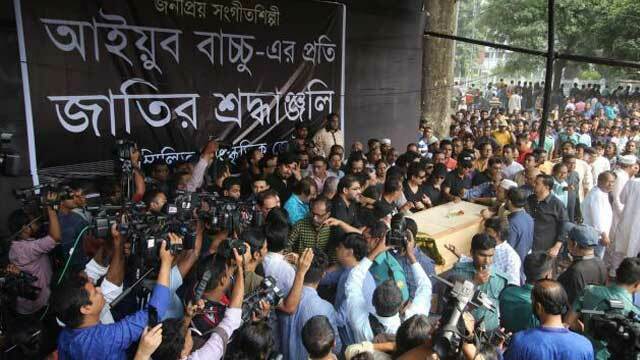 Dhaka, Oct 19 (Just News): People from all walks of life are paying their last tributes to celebrated guitarist, songwriter, composer and singer Ayub Bachchu at the Central Shaheed Minar in Dhaka on Friday. The body of the popular singer was taken to the Shaheed Minar around 10:30 am and it will be kept there until 12:30pm. Singers, musicians, cultural personalities and fans started crowding the venue since early morning. Necessary preparations have been taken so that fans and people from all walks of life can pay their last respects, according to Sommilito Sangskritik Jote. Road Transport and Bridges Minister Obaidul Quader and Cultural Affairs Minister Asaduzzaman Noor, among others, placed wreaths on the coffin of Bachchu. Talking to the reporters, Road Transport and Bridges Minister Obaidul Quader said, "We are shocked at the untimely death Ayub Bachchu. I pray for the salvation of the departed soul." A namaj-e-janaza will be held at the National Eidgah after Jumma prayers. Bachchu will be buried next to his mother at their family graveyard in Chattogram on Saturday. He left behind his wife, a son and a daughter, alongside a huge number of relatives, disciples and admirers to mourn his death. The rock legend and founder of musical band LRB died of a heart attack in Dhaka on Thursday at the age of 56.